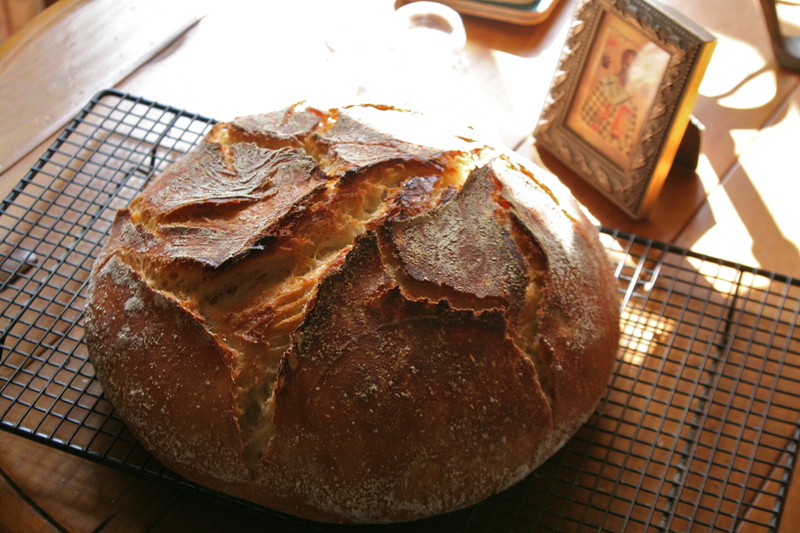 The discovery of Jim Lahey’s recipe of a “no knead” bread has brought, oh, so much deliciousness into our home. 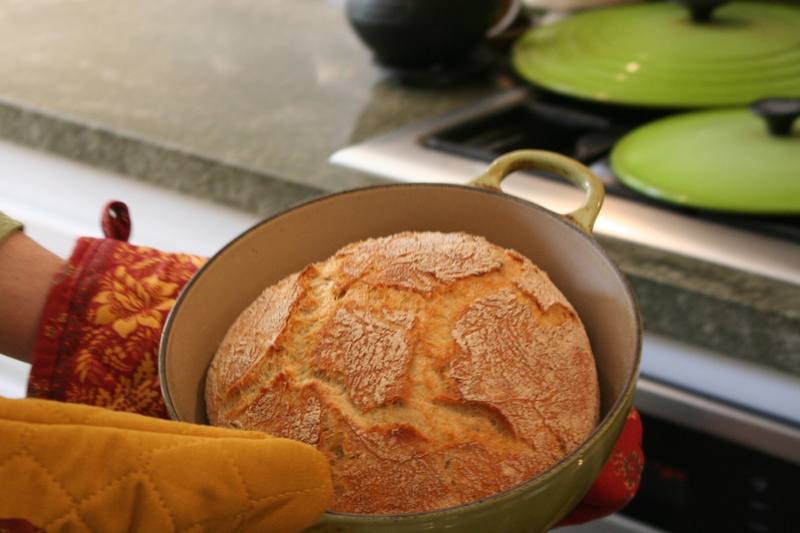 I’m used to good hearth bread, having grown up as a baker’s daughter, and to find something that I can make, that resembles the French and sourdough of my youth, is…..yum! My older brother first alerted me, about two years ago, to this method of baking that was gaining in popularity. Since I like to experiment when I bake, I’ve played and fiddled with Mr. Lahey’s original recipe. Even he has. You can see how the recipe has evolved from the initial NY Times article to his actual measurements and techniques that he then published in his book, My Bread. Others have fiddled and played, too, but I’ve received so many questions about this technique that you now have my simplified version–with gads of photos to help you see the process. 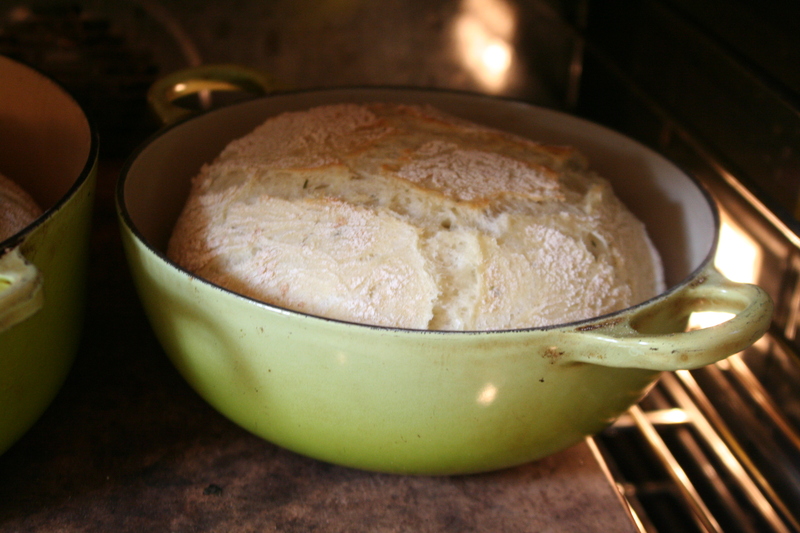 If you eat wheat, if you like a little bread in your diet, if you own a cast iron or enamel pot (if you don’t, think about tracking one down), then try making this bread. The process is a bit messy–that’s the downside, but the effort is minimum, and the result is, as my five-year-old would say, delish! 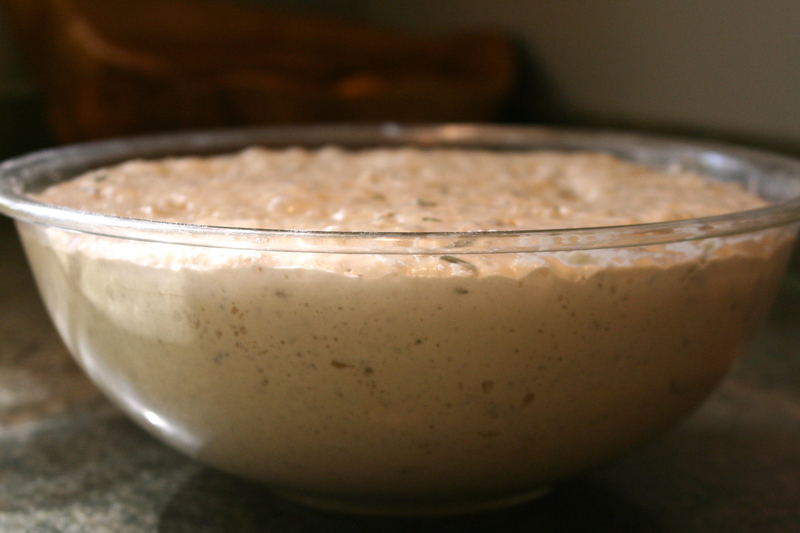 Because the mix of this dough is so moist, you need very little yeast, one of the most costly ingredients in making bread. Also because of the high water content, the loaves stay good for days and days. And…because the first rise is so long, there’s a ton of flexibility schedule-wise, as to when you need to be in the kitchen. Oh, another added bonus–the loaves are beautiful. I love beautiful bread. 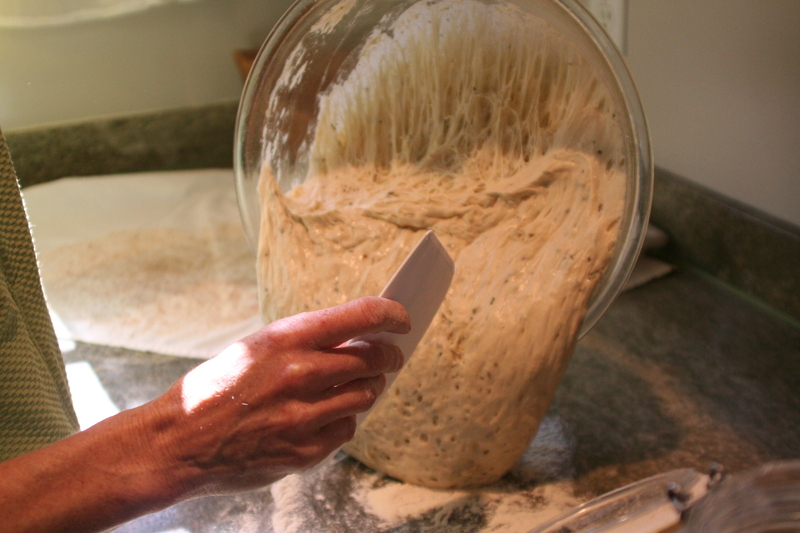 Time Commitment: Ten minutes to measure and mix the dough. 8-15 hours of just waiting. Fifteen minutes to shape loaf for second rise. Another 1-2 hours of waiting. And an hour to bake. Time. 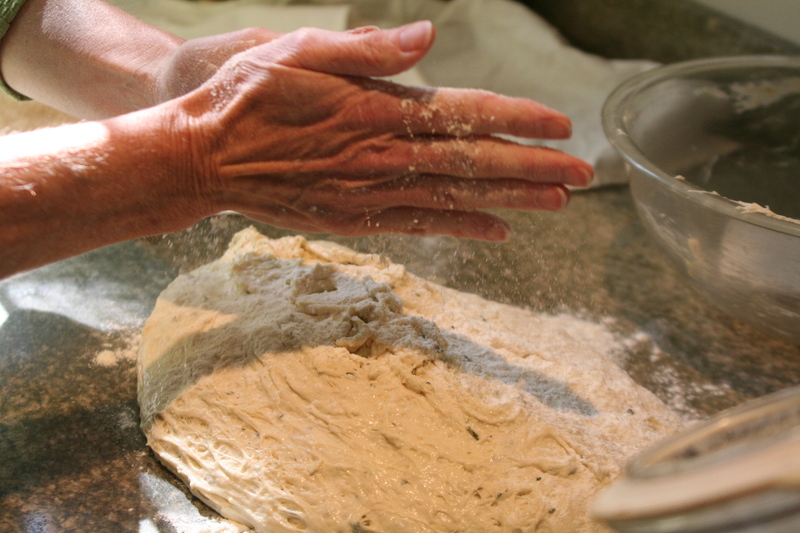 You need lots of time to let the dough really develop, but it’s really only about 20-30 minutes of hands-on work for the baker. Step Two: Scrape the dough off the wooden spoon. 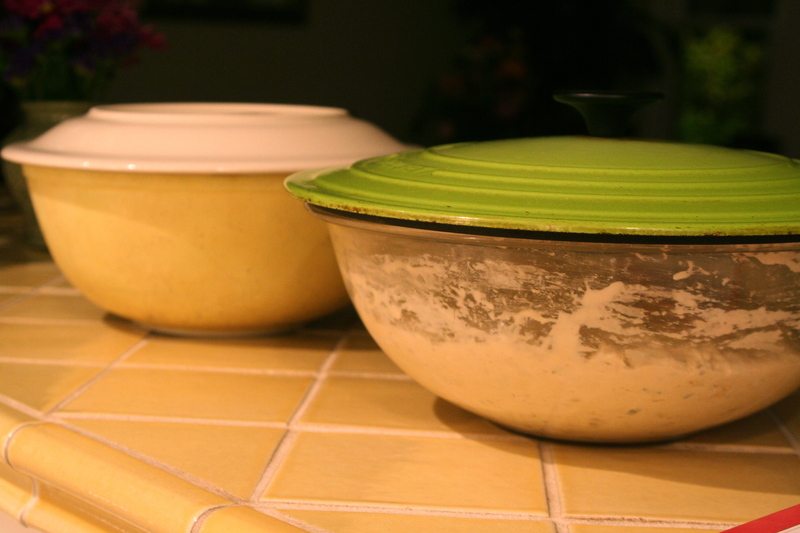 Cover the bowl with a plate, or a pot lid, (you can use plastic wrap, but I like to use something that you don’t throw away) so that very little air is seeping into the bowl. 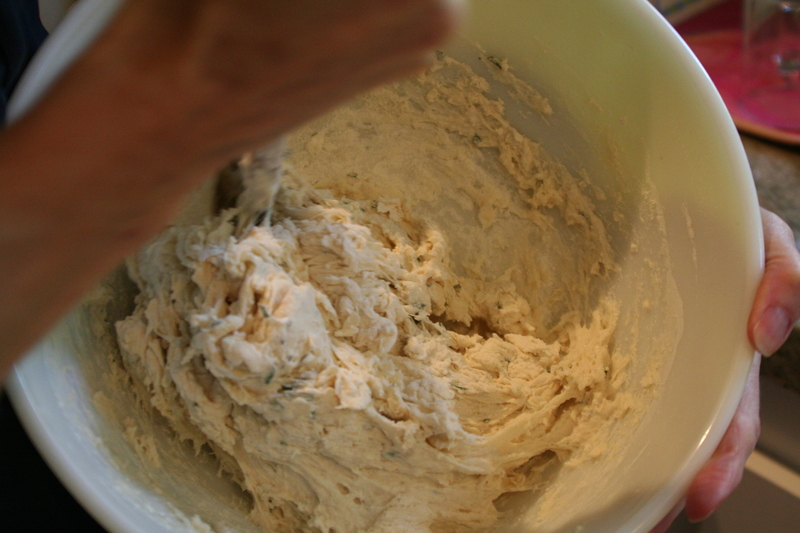 Let the dough rise for at least 8 hours–or up to 15. 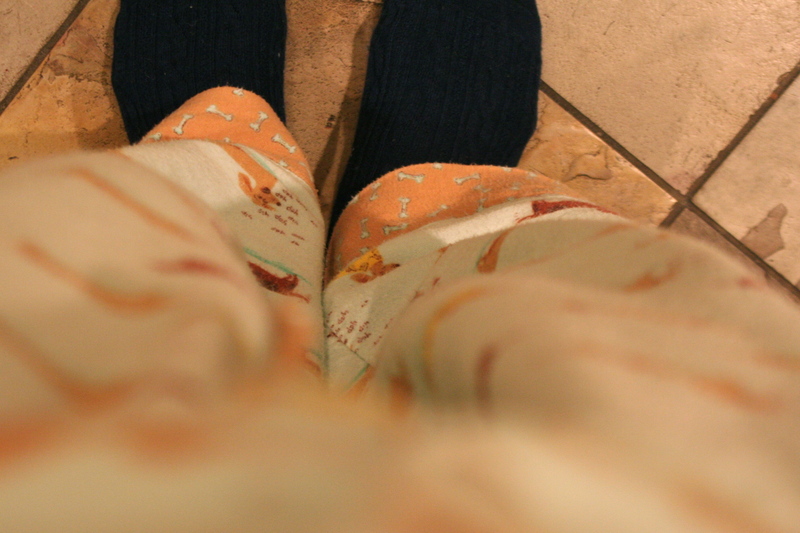 Step Four: Prepare the towels. 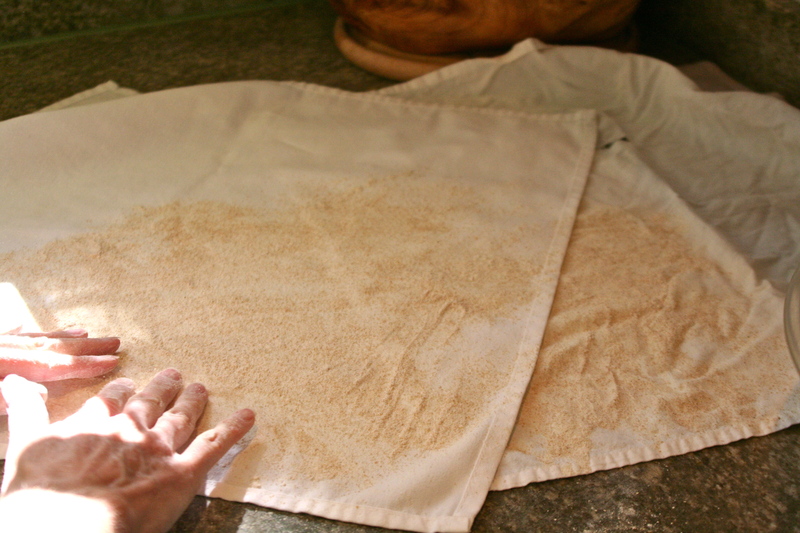 I typically rub flour into a large corner of the towel, then sprinkle it with bran. You can also use corn meal, or whole wheat flour.) This provides a barrier so that the wet dough does not adhere to the towel later, when you need to dump the dough into the hot pot. 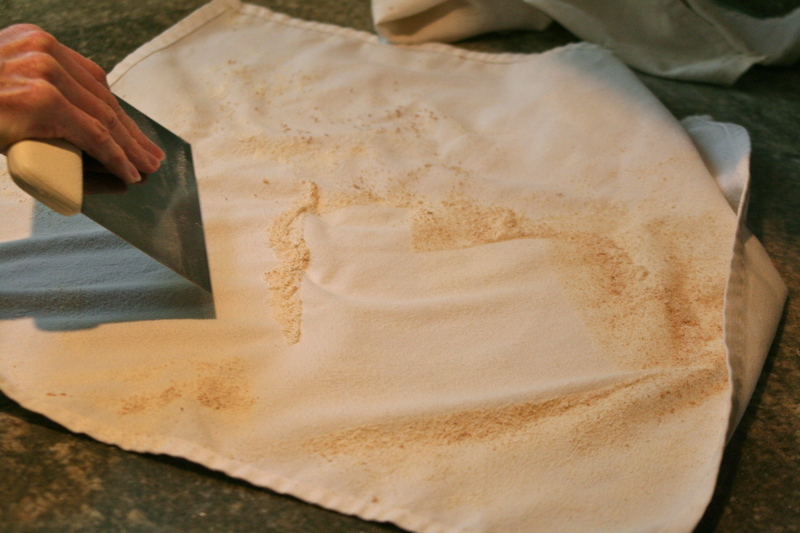 Be generous with this layer of flour on the towel. Step Five: Flour, flour, everywhere. 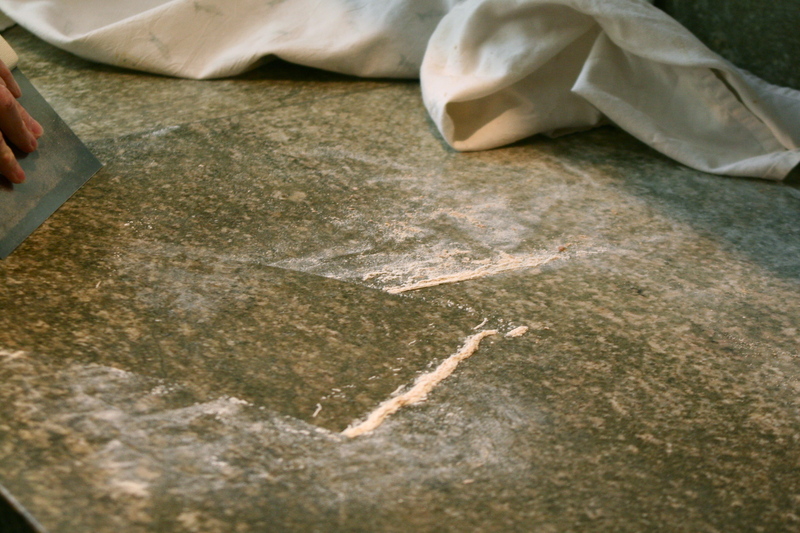 Flour your countertop. 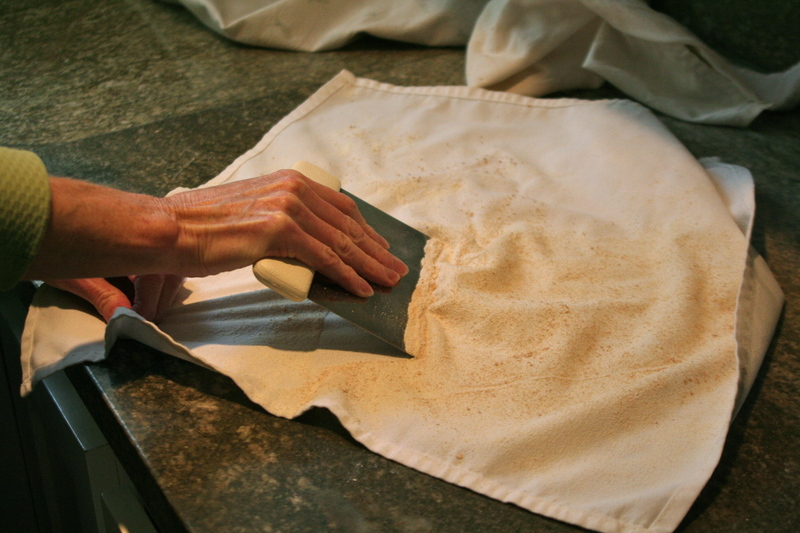 Scrape the gooey dough onto the counter with a plastic dough scraper or a plastic spatula, and sprinkle with flour. 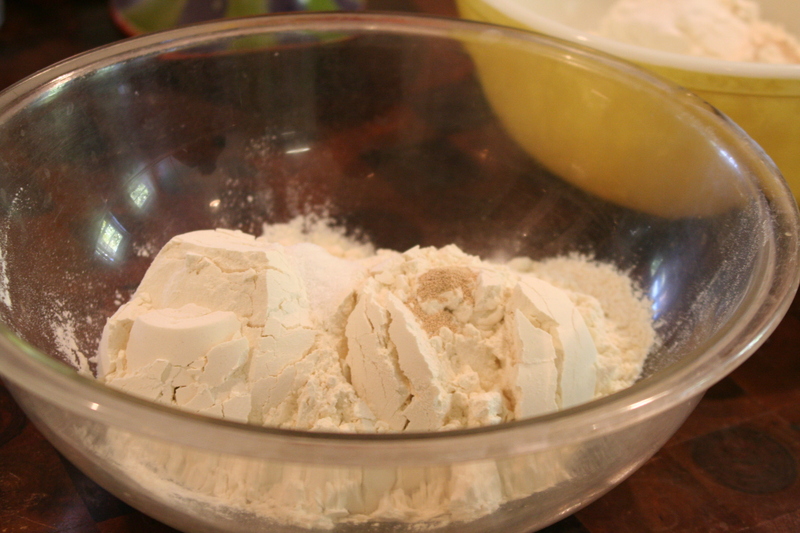 Flour your hands and fold the dough in half, or thirds, incorporating the new flour. Fold again. 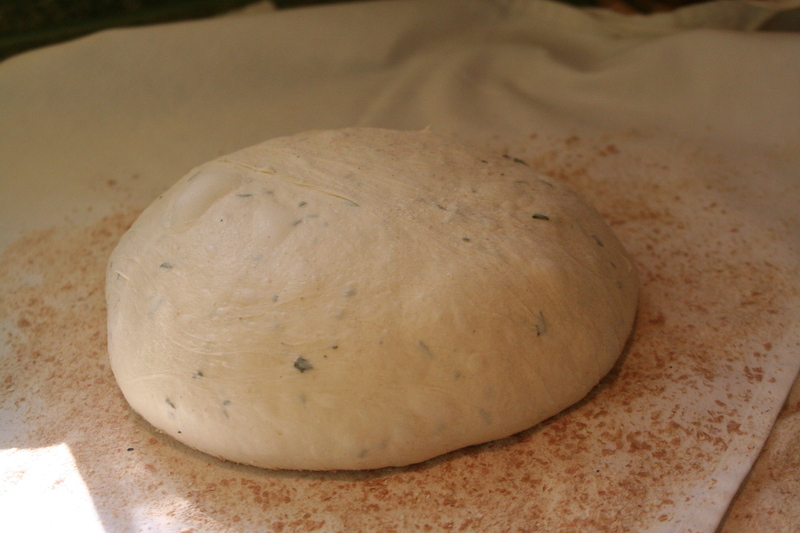 Then, tuck the edges under, while spinning the dough slowly in circles to shape it into a round. 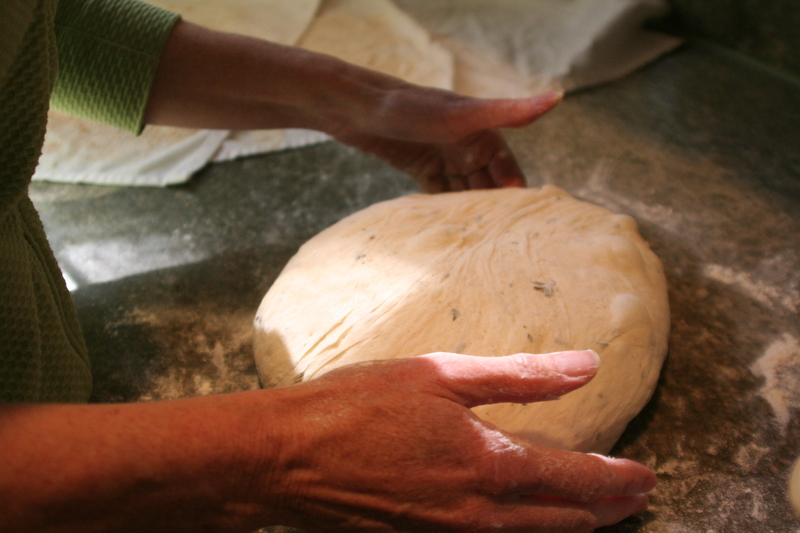 Keep tucking, and shifting in a circle, flouring your hands if the dough sticks. Do this until you have a smooth top. The underside should be all wrinkled and tucked, and that’s great. That will create the patterned top crust later when it gets flipped into the pot. Step Six: Sprinkle flour and bran on the dough, making sure you get some onto the sides since the dough will rise and spread. 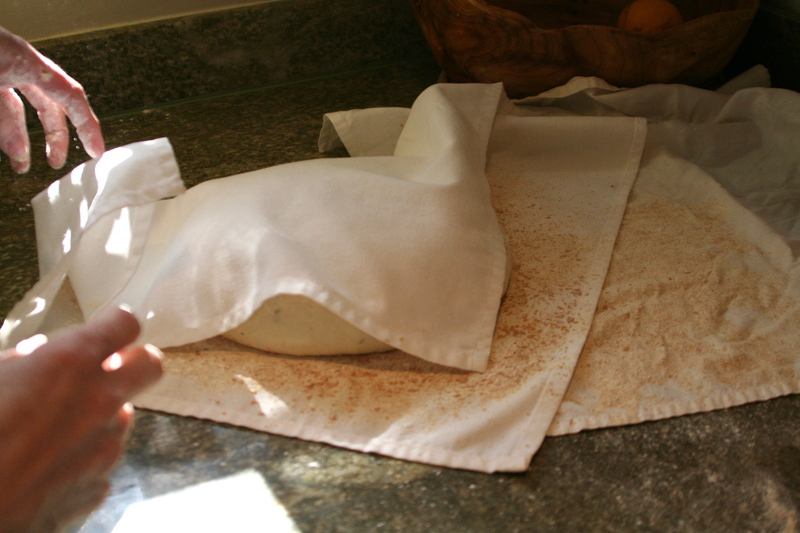 Fold the towel over the dough and cover with yet another towel and let rise up to two hours, but not longer. 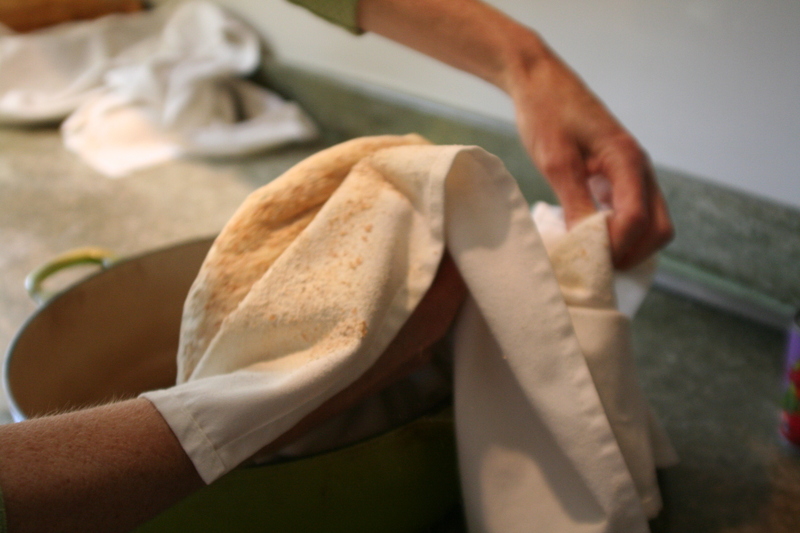 Step Seven: Allow the dough to rise in the towels for an hour, but no more than two. A half hour before baking, preheat the oven to 450 degrees, heating the pot in the oven as well. Step Eight: Make sure your area is clear. You’re going to be working with super hot, heavy pots and my biggest worry with this method is being burned. 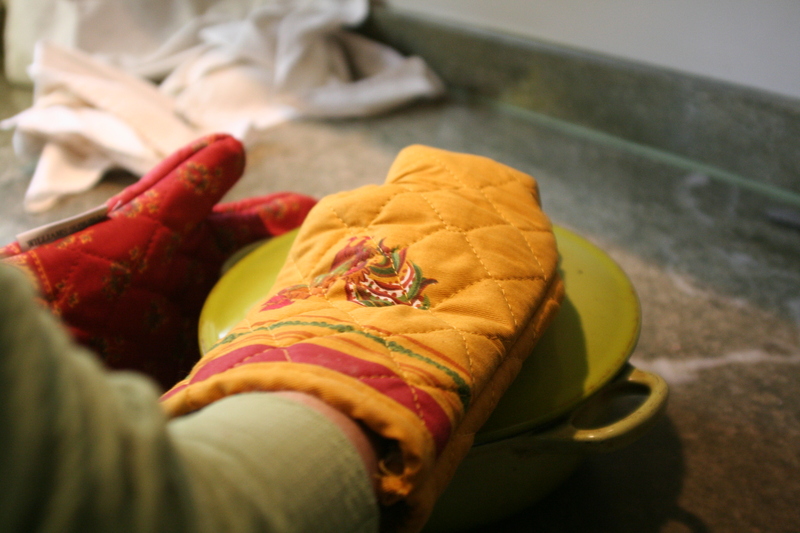 Please be careful… Using oven mitts, take the hot pot out of the oven and place it on a non-burning surface. 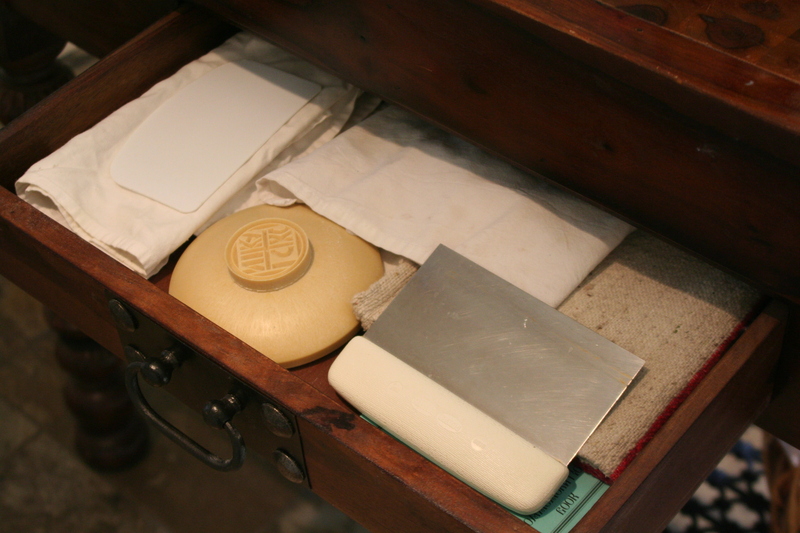 I place it directly on my granite counter top, removing the lid, placing that on my stovetop. Unwrap the dough from the towels, slide your hand under the towel with the dough, and tip it upside down into the hot pot. Flour and bran will likely spill all around. Remember, the pot is hot. 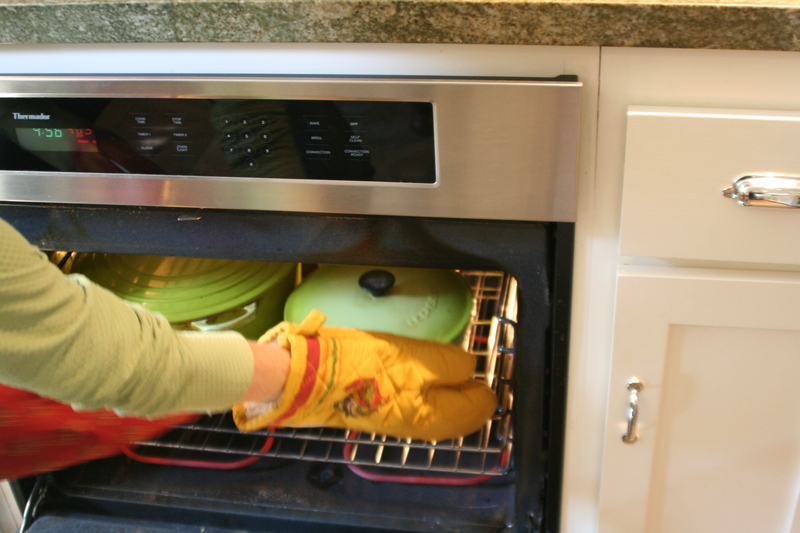 Use oven mitts to hold the pot, and shake it, distributing the dough evenly in the pot, then place the lid on, and put the whole thing into the oven. Step Nine: Bake at 450 with the top on for 30 minutes, remove the lid, and bake another 25-30 minutes. Step Ten: Remove the hot pot from the oven, dumping the loaf onto a cooling rack. 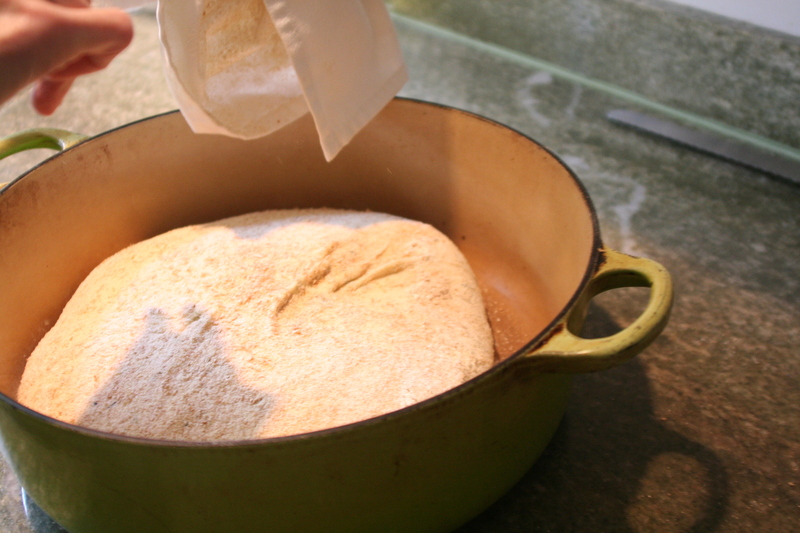 Allow the bread to cool for at least an hour. Step Eleven: Clean up. 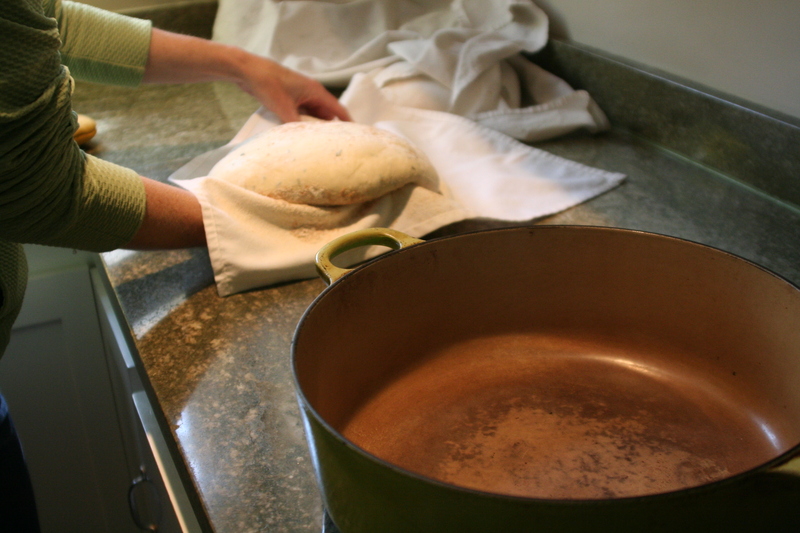 I use my metal dough scraper to clean up in a snap. 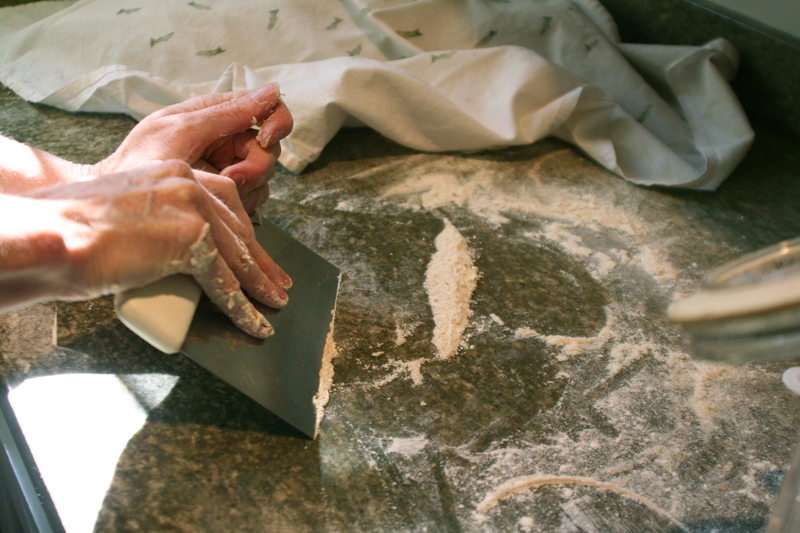 For the counter, I simply scrape all the excess flour into a pile and transfer it into the trash. With only a bit of dusting left, I then wipe the counter down with a sponge. Step Twelve: Share. Either cut your loaf in half and share with a friend, or bake two at a time–like I do. You can easily double this recipe–just make sure you have a pot big enough to bake in. Adding cheese into this mix is delicious! Just grate your favorite cheese, any amount, but probably not more than a cup, and mix it in right at the beginning. 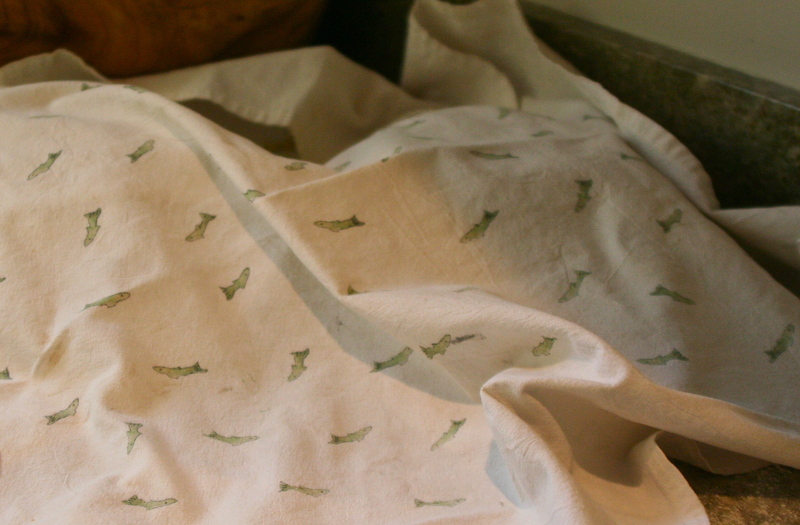 Another version I love making– is by doubling the recipe (6 cups of flour), reducing the water by 1/4 quarter of a cup, and adding in a whole jar of olive tapenade. 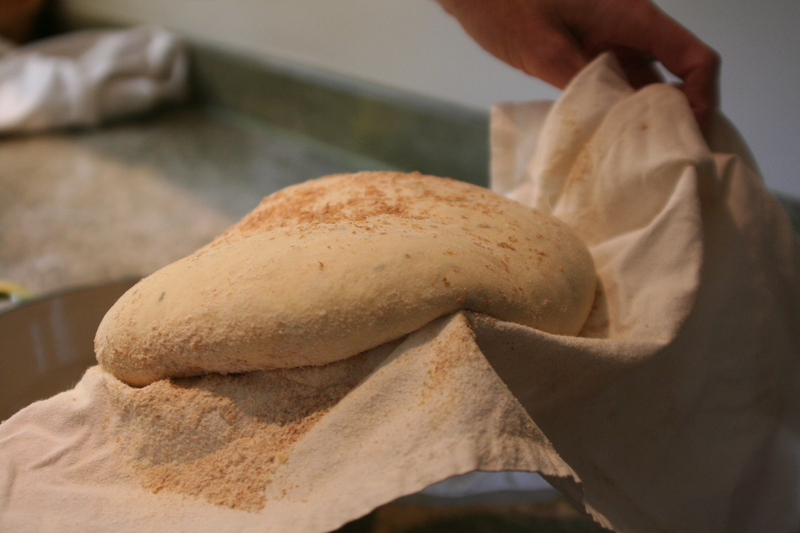 You don’t always have to make this dough into a big boule. 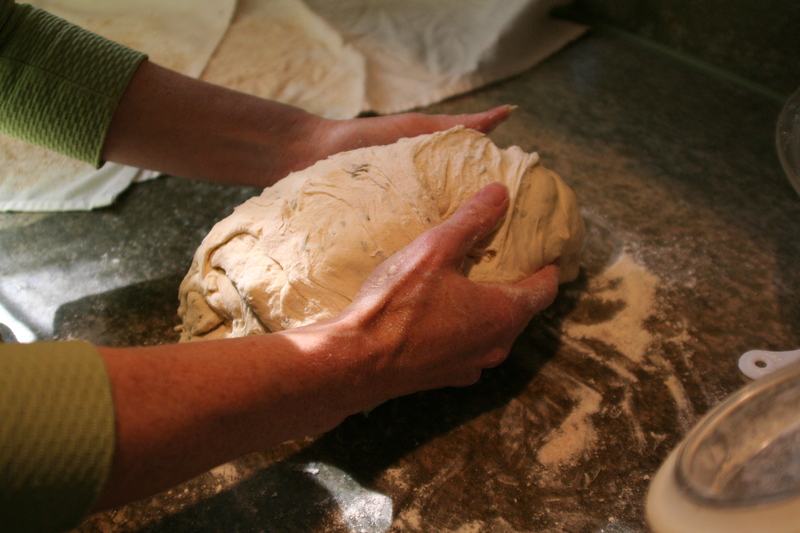 After the first rise, if you mix a fair amount of flour into the wet dough, you can then make any shape you like. But… if you want to bake in the pot, then you are constrained by the shape of the pot you want to bake in, so unless you have an enormously long pot–baguettes are out! However, you don’t have to bake in a pot! You can flour up that dough, shape an elegant baguette or two, give it a short second rise, and slide it onto your baking stone for 30 minutes or so. Voila! 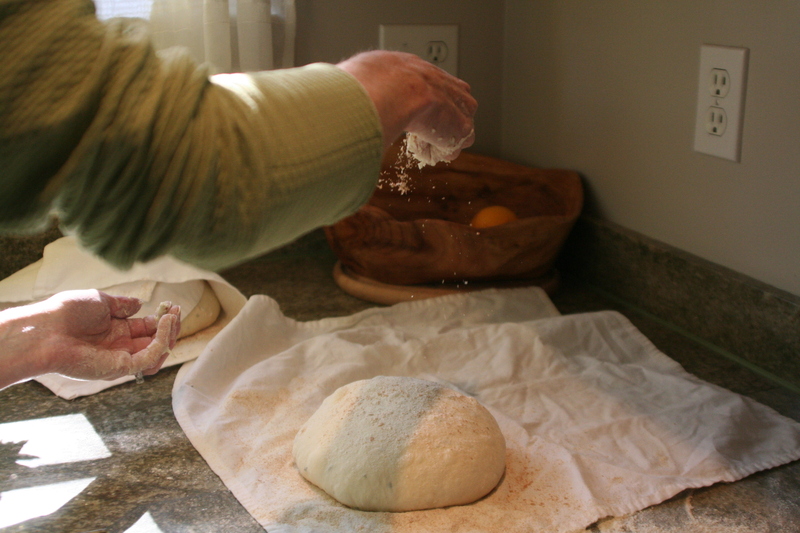 This entry was posted in Recipes and tagged no knead recipe, no knead recipe with photos by janegmeyer. Bookmark the permalink. A wonderful post, Jane. Beauty, beauty, everywhere! 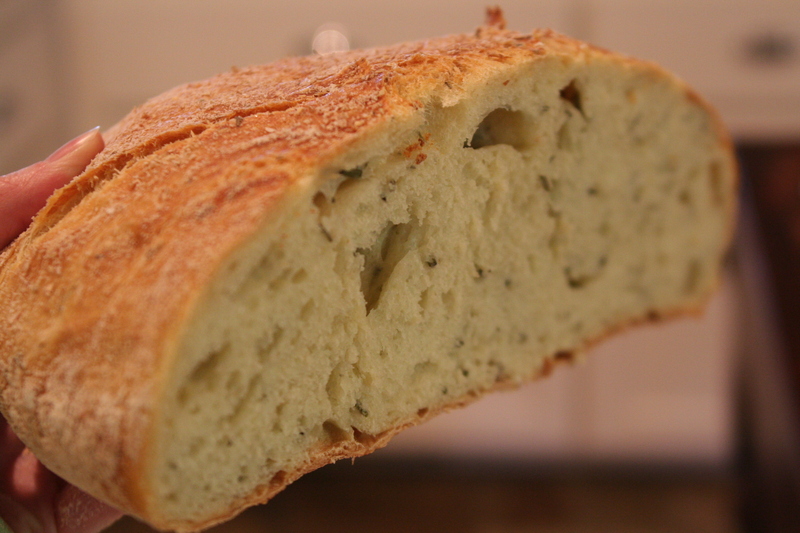 Your bread looks good enough to eat now, yum! Good morning and thank you for sharing both recipe and resources. “My Bread” has really great reviews on Amazon. I got up early and just mixed my first batch and am anxious to see how it turns out later this evening. I used “Healthy Bread in 5 Mins. Day” for a while and really enjoyed it, howerer, due to the small Europen sized fridges here it was really difficult to store the dough. Will give this a try especially if I dont have to bake everyday. Love the idea of using my cast iron pots for more. Thank you again. Jane, it looks like you really use your cast iron pot. Would like to ask you if you only use it for bread or do you make casseroles etc??? Thank you, thank you, thank you. I’ve been w-a-n-t-i-n-g to do this, but now with step by step directions, inspiration and photos, maybe I really will! Especially now that school is out and it is officially summer (somehow my business and responsibilities don’t diminish but the feeling that life is more relaxed is present). Thanks for the great pictures and instructions! So inspirational! Just wanted to ask, how many quarts is the cast iron pot that you show here? I don’t have one, but was thinking I’d like to get one.